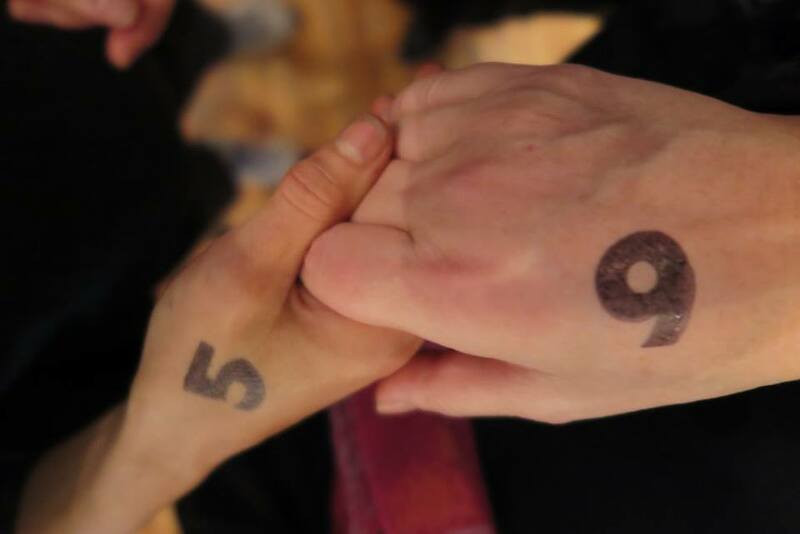 On the weekend of November 11-13, 2016, Irina Danilova and Hiram Levy performed Mix and Match 5&9 in Orlando, Florida. 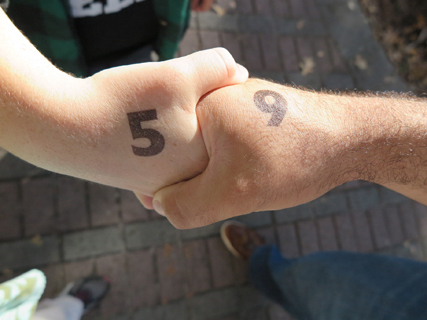 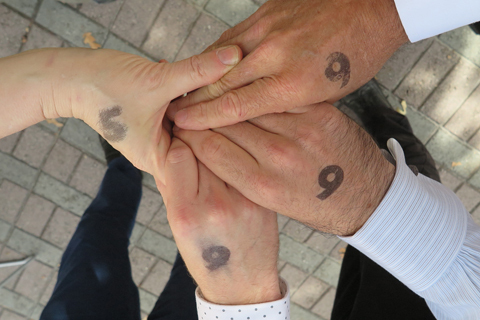 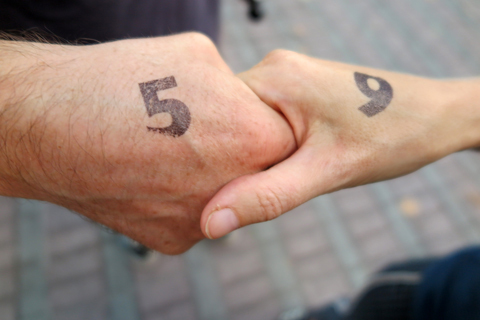 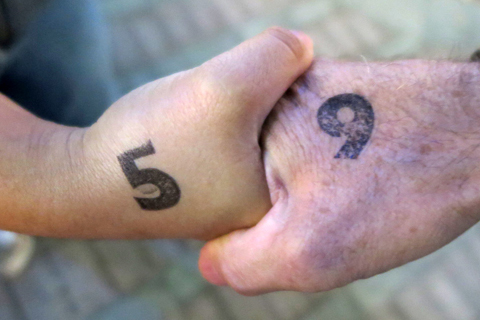 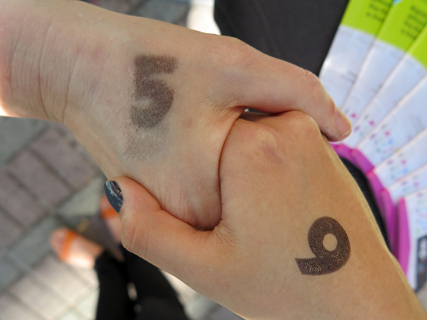 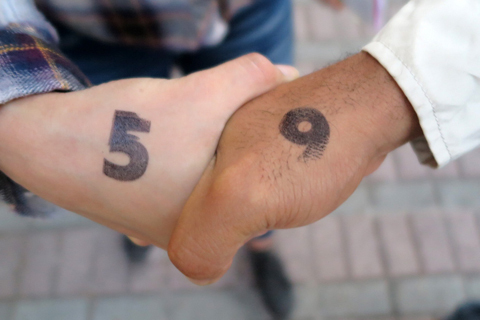 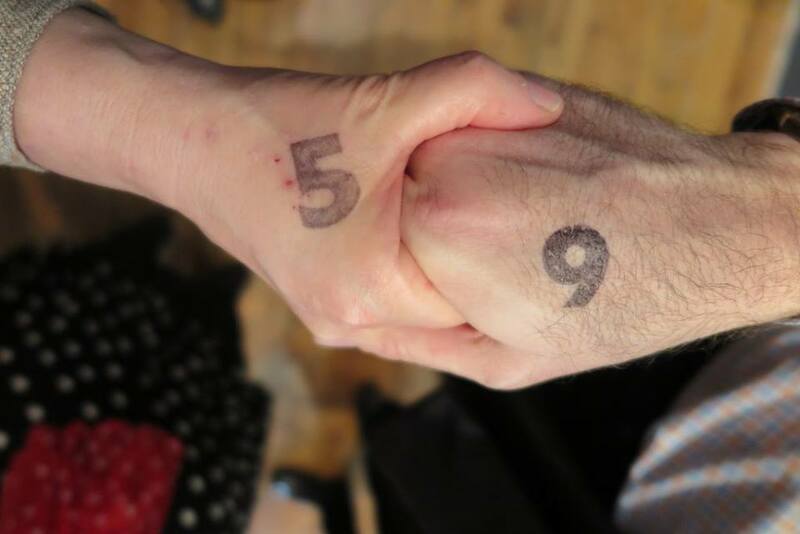 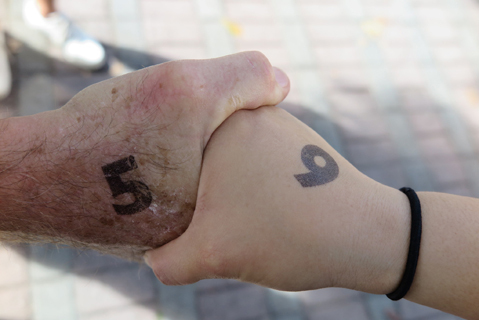 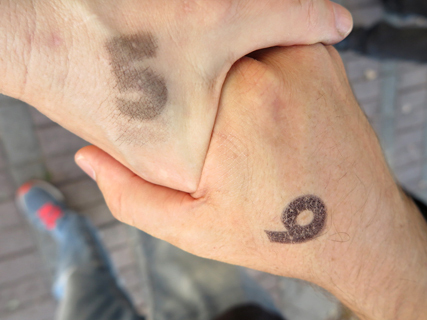 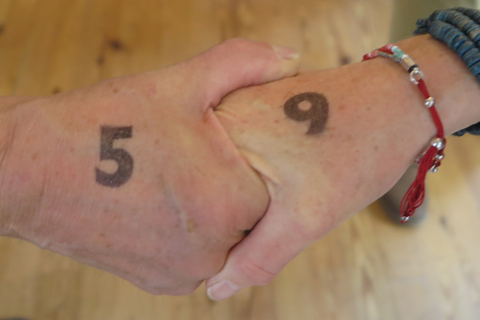 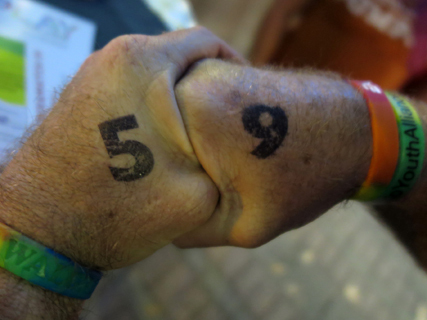 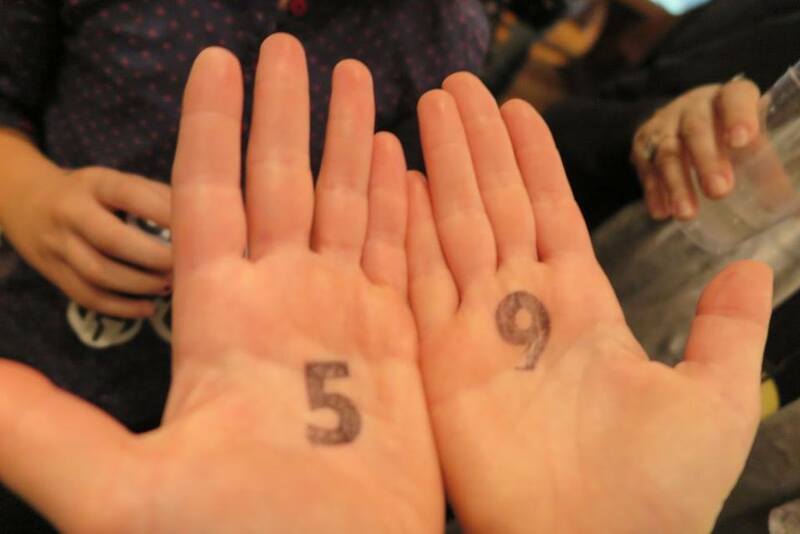 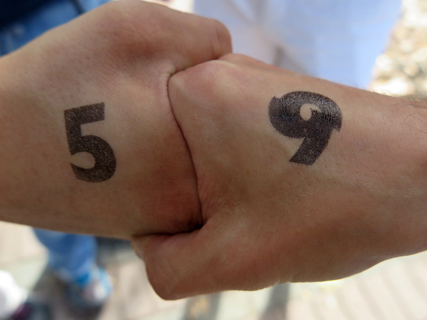 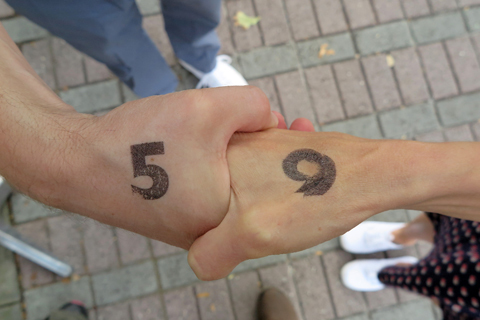 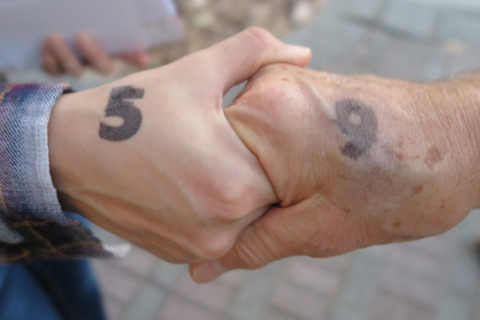 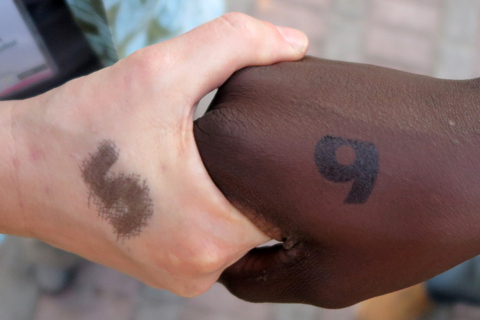 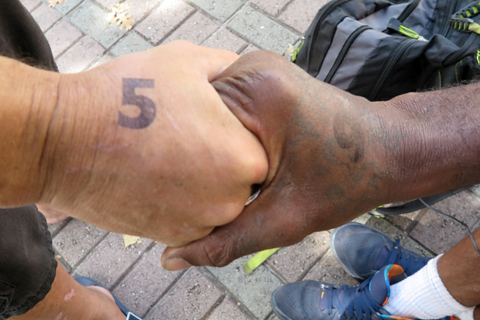 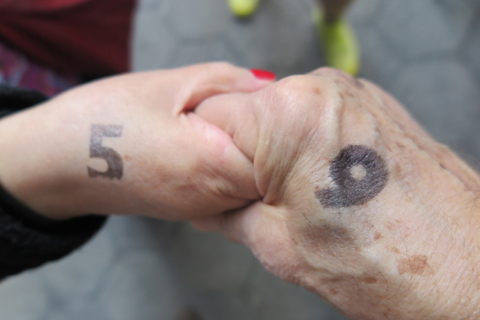 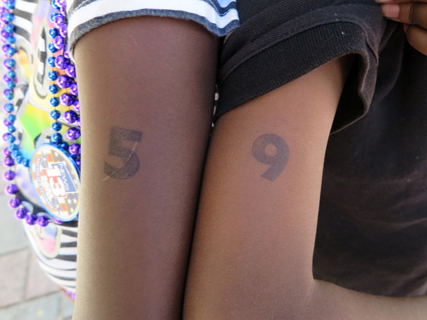 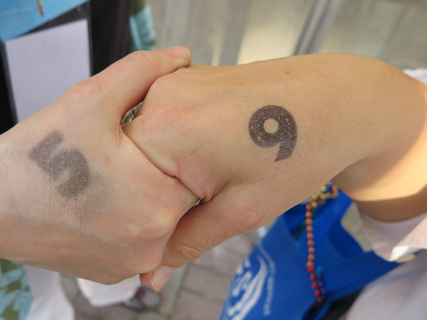 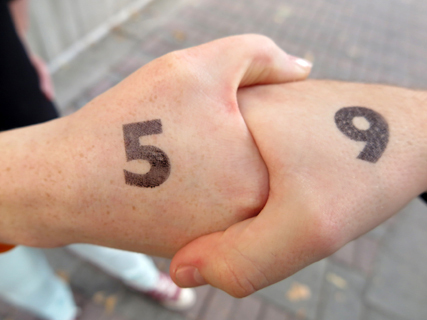 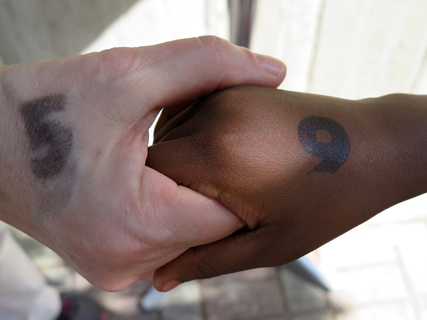 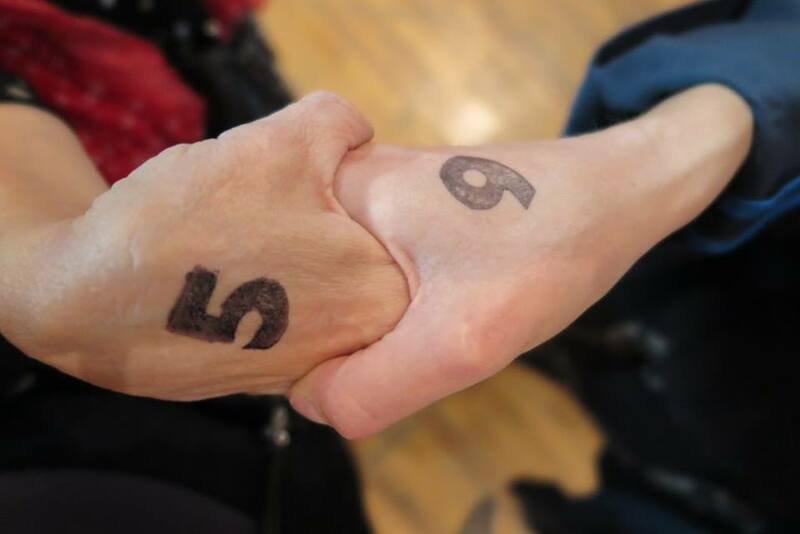 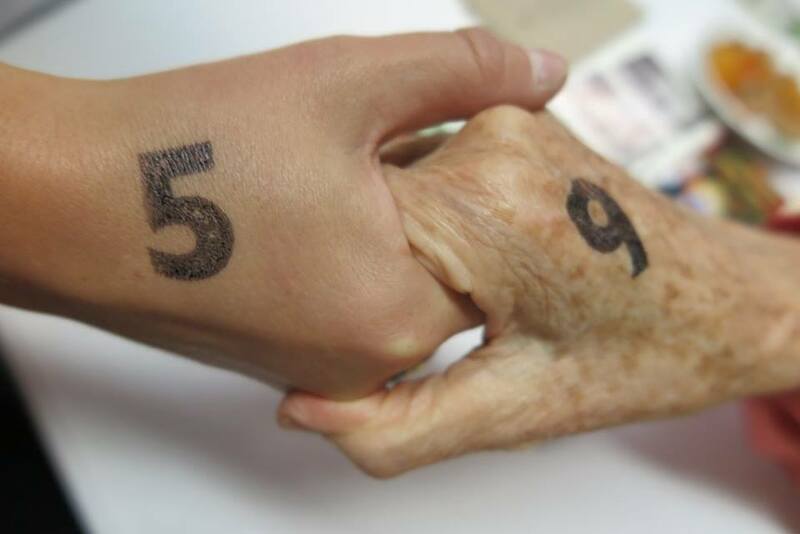 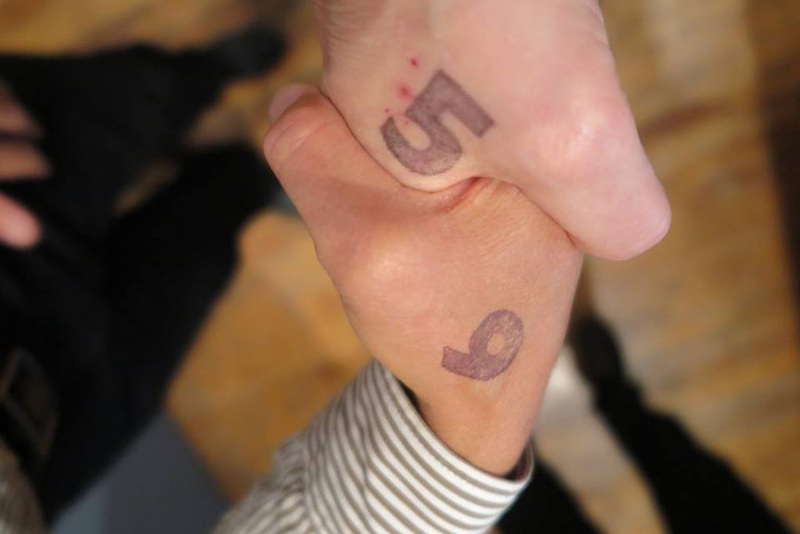 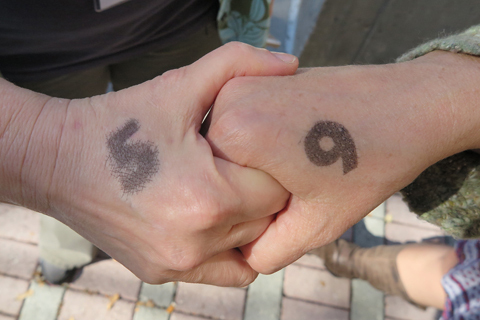 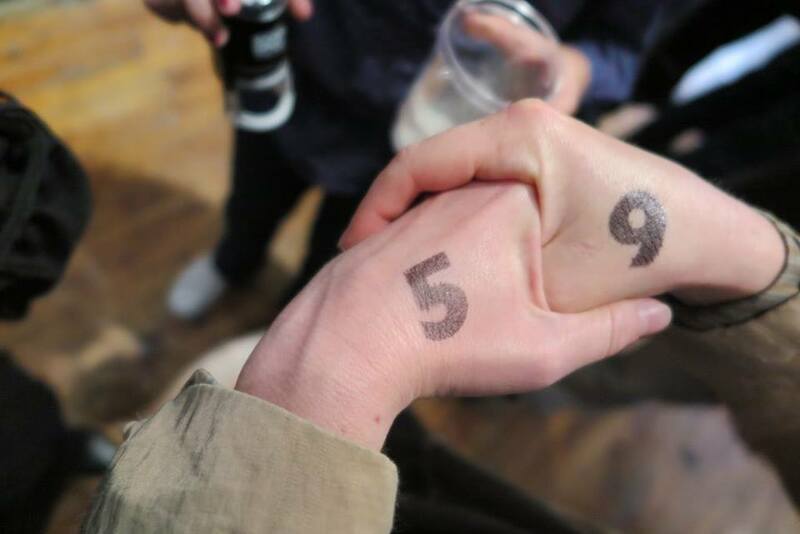 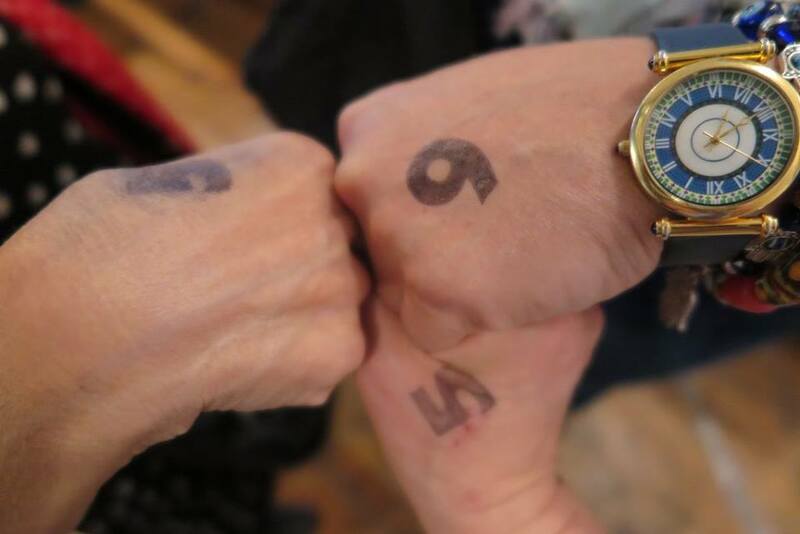 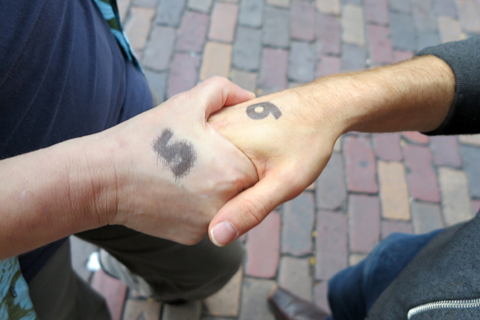 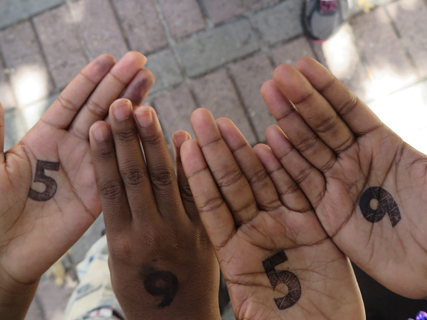 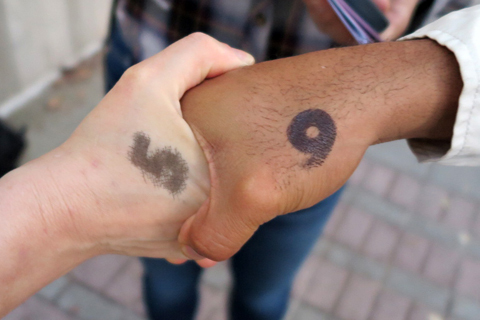 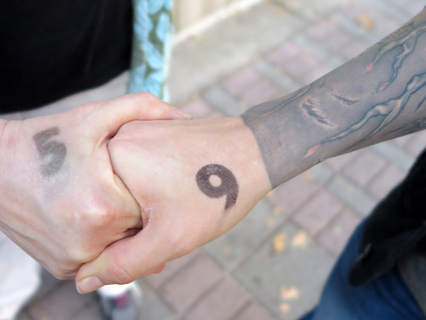 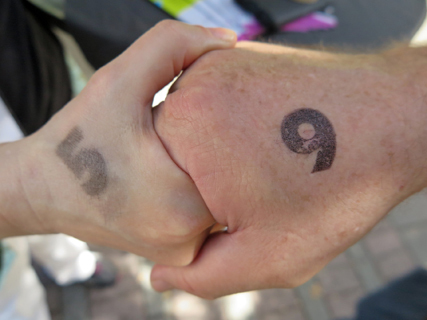 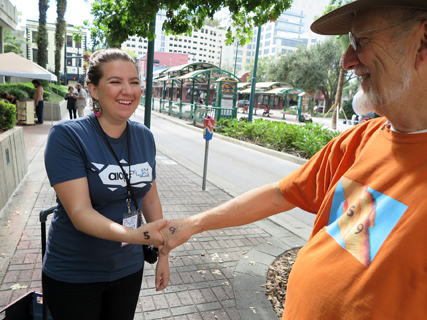 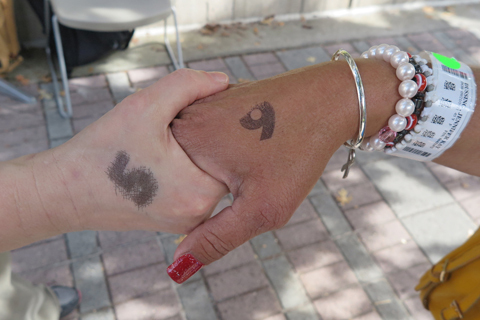 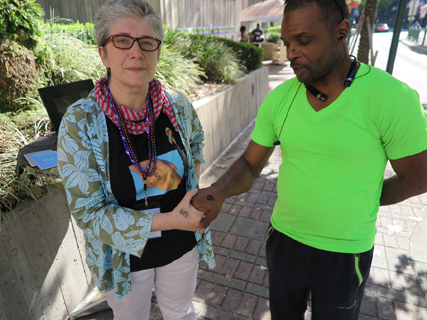 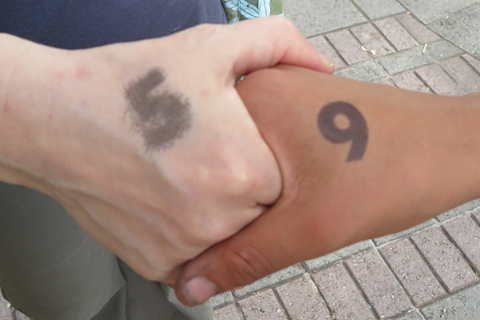 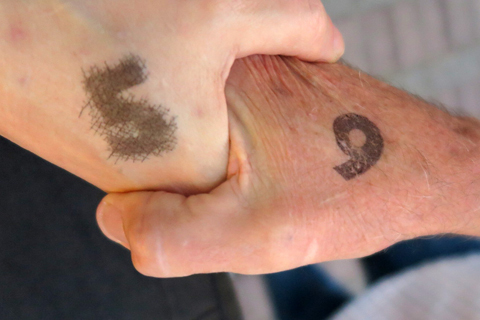 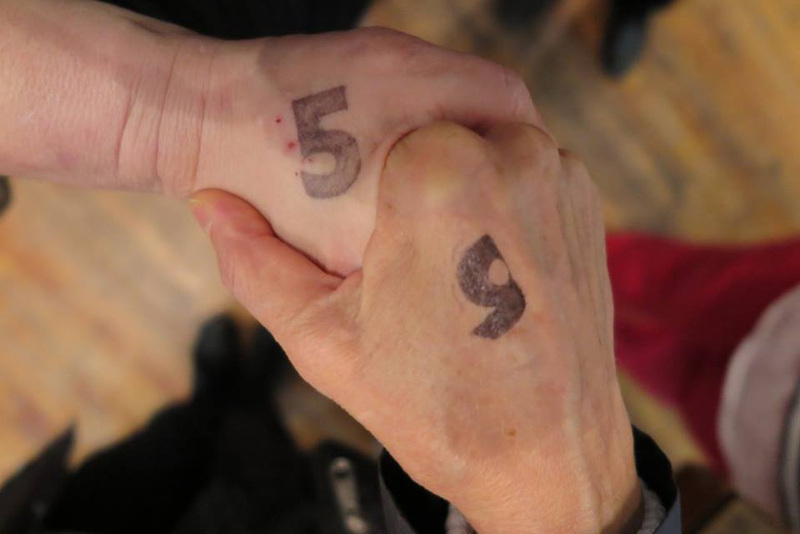 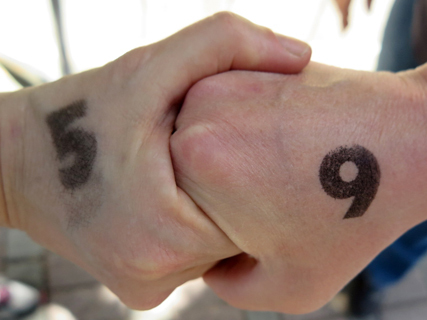 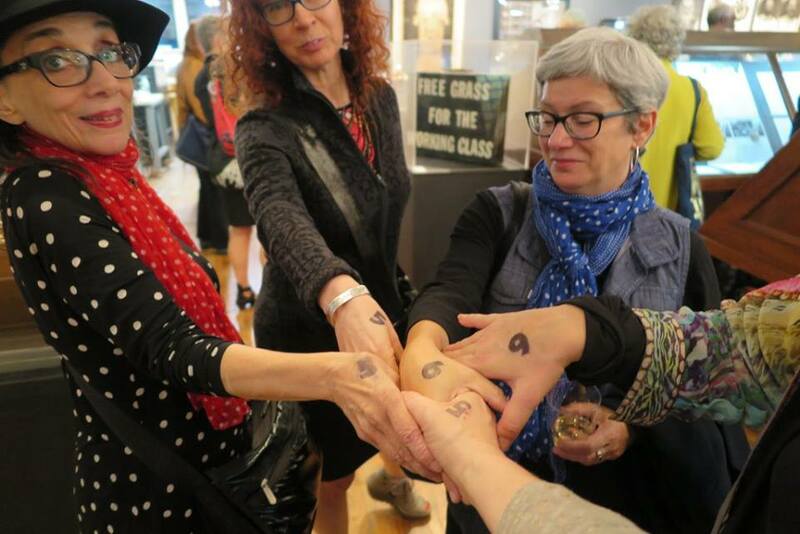 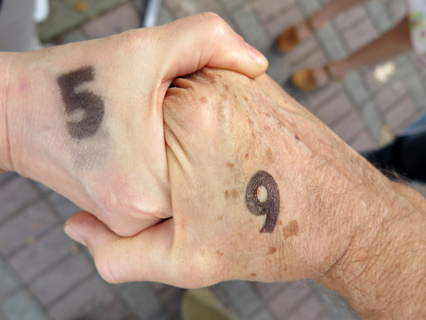 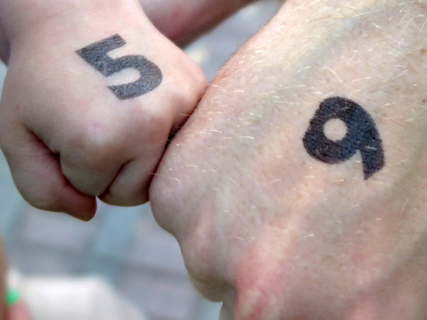 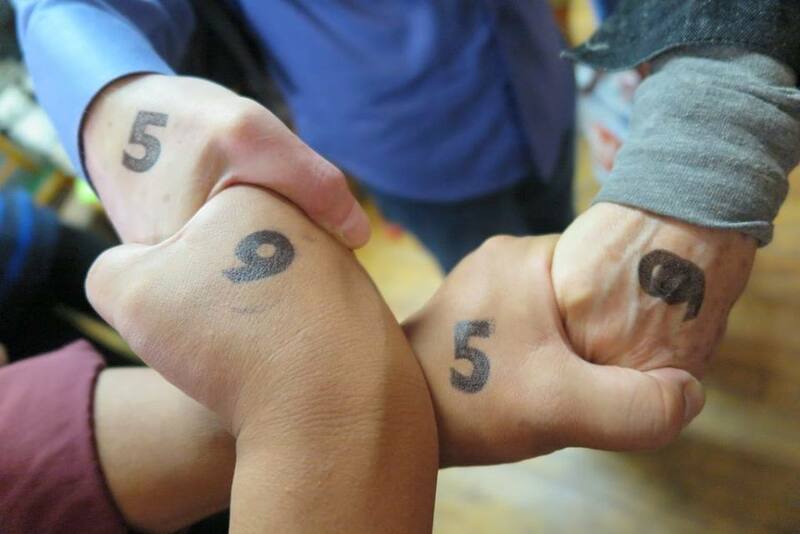 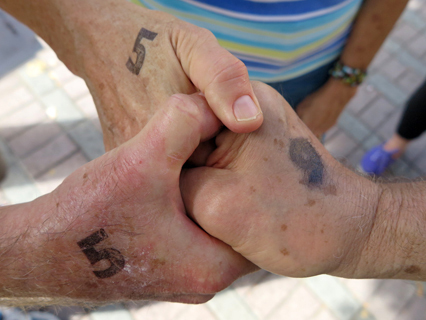 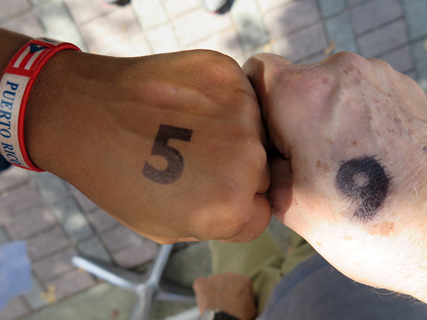 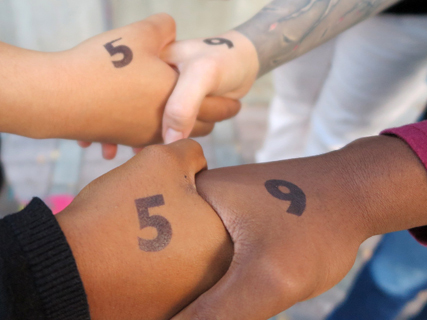 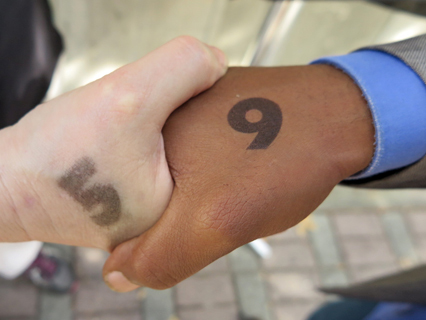 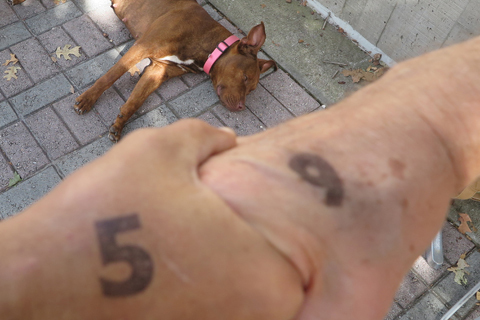 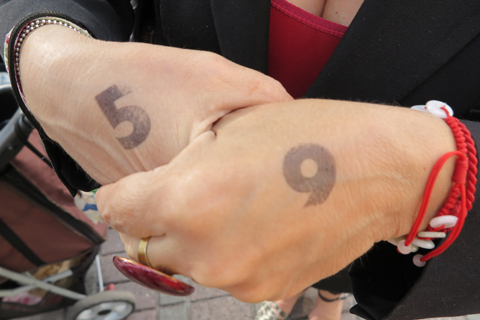 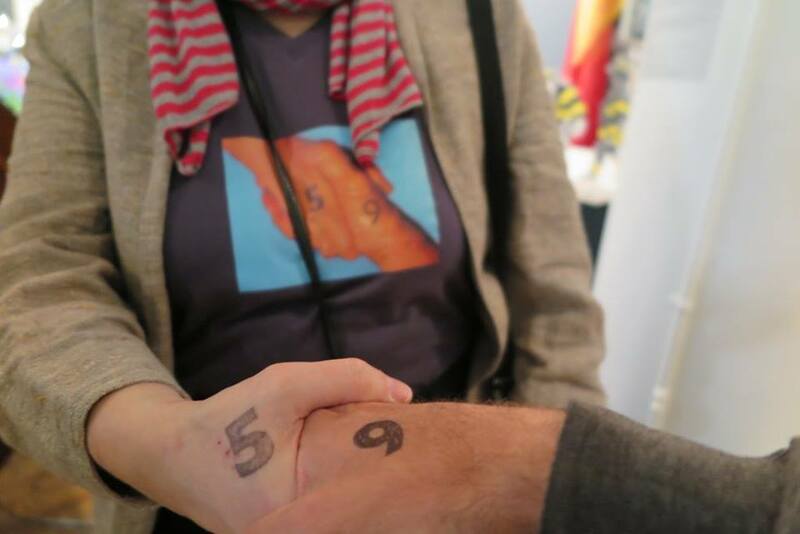 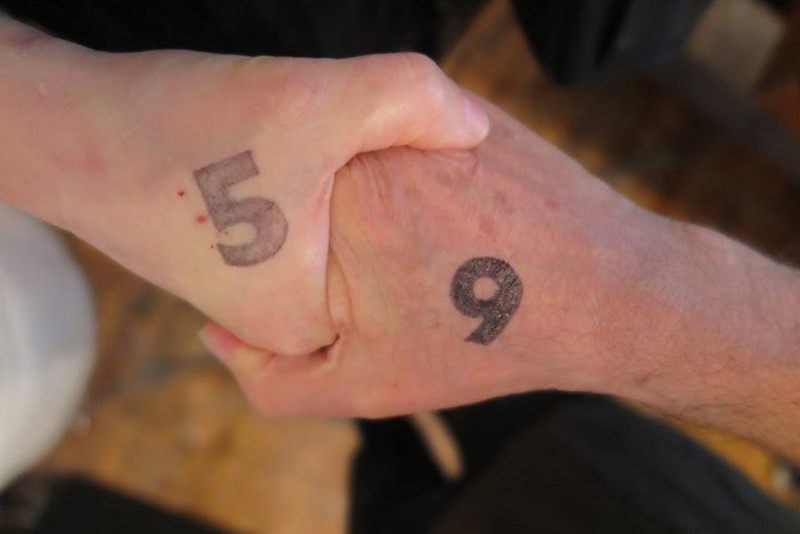 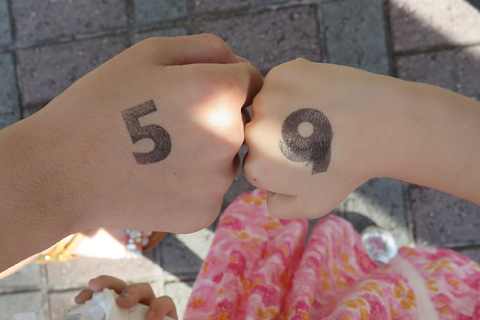 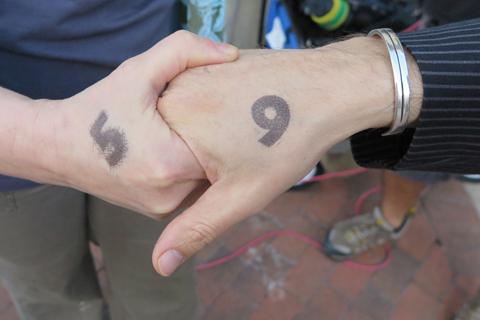 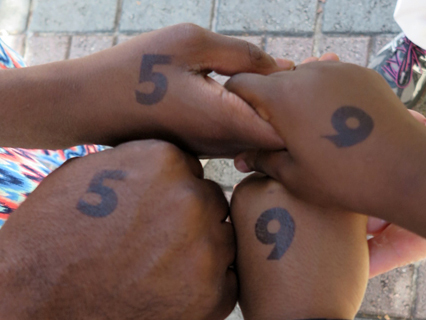 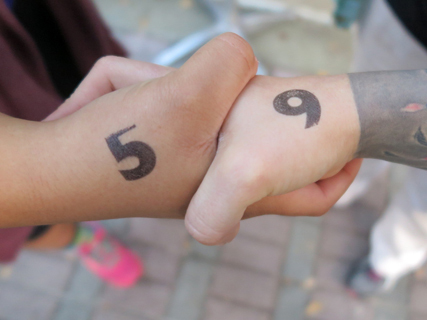 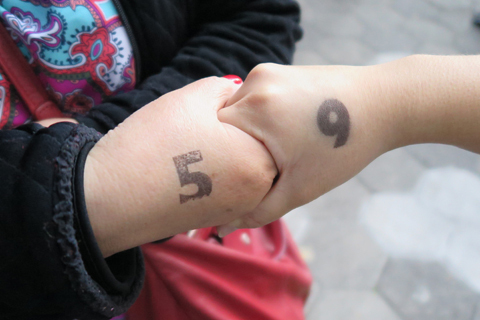 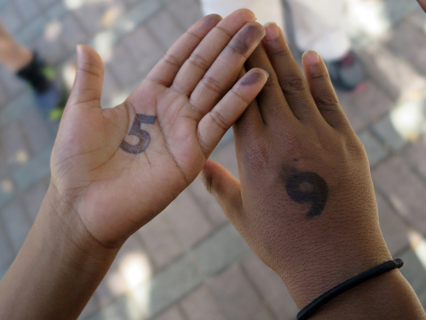 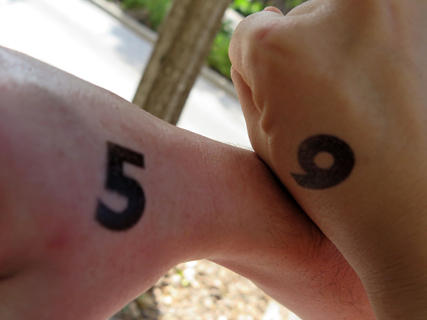 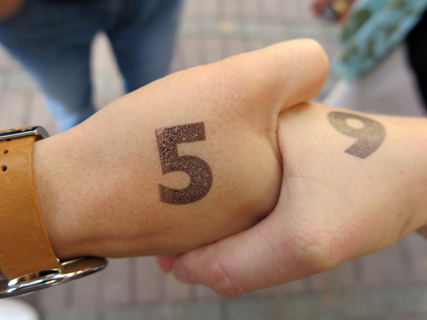 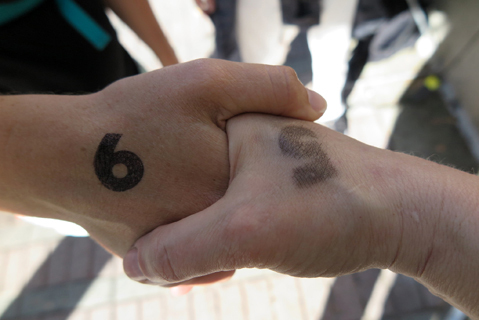 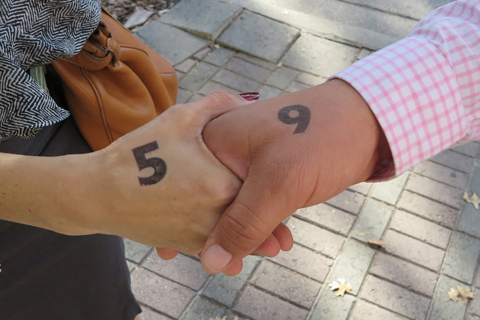 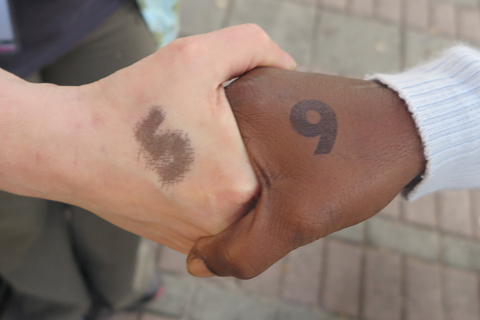 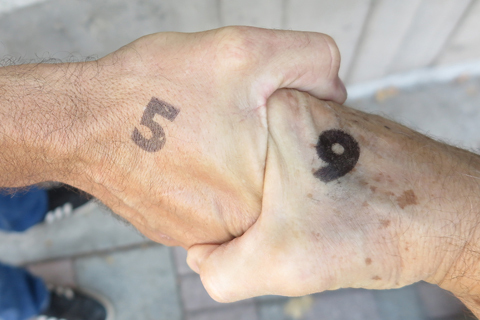 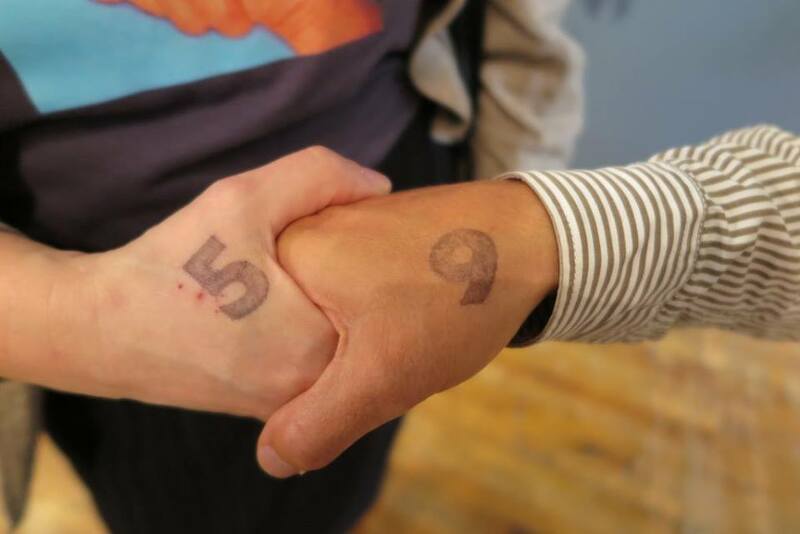 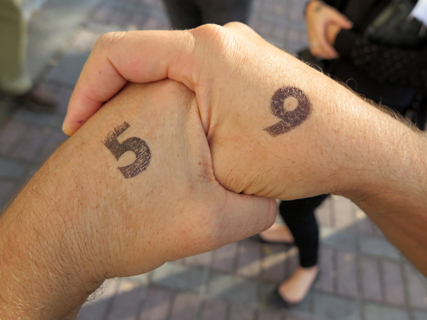 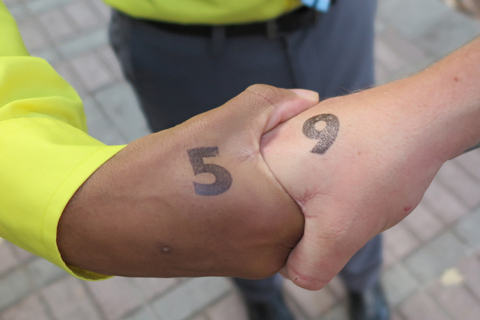 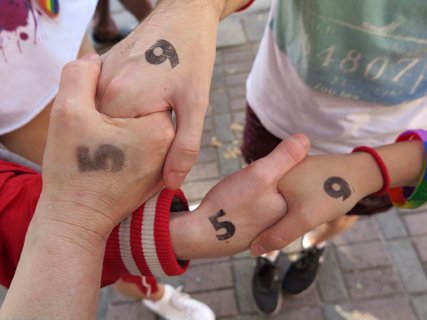 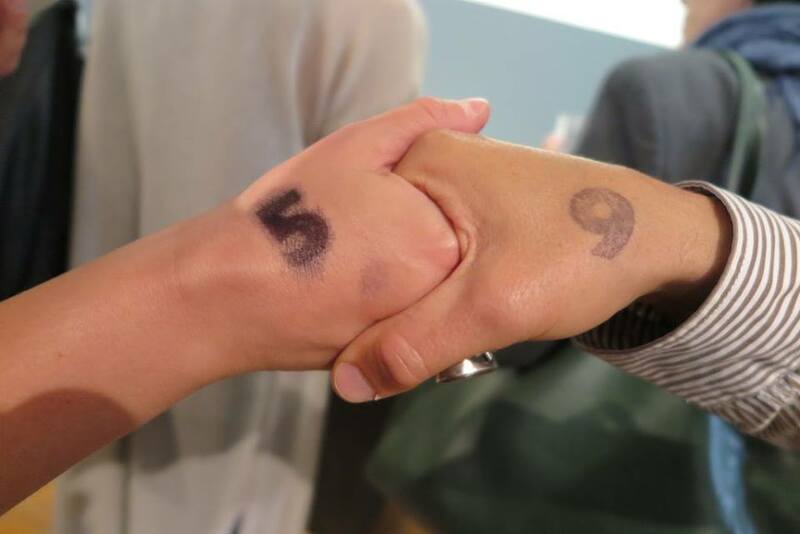 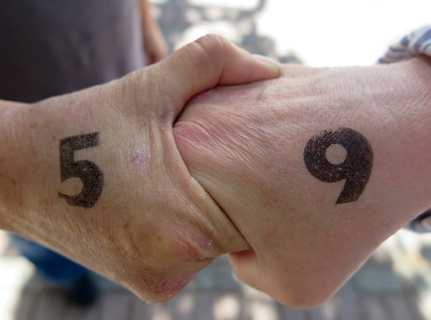 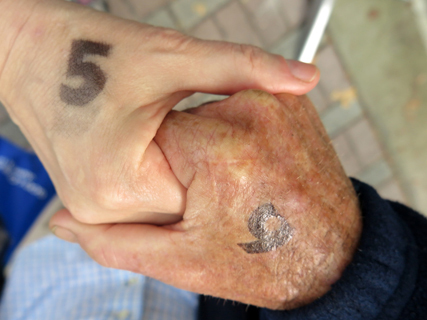 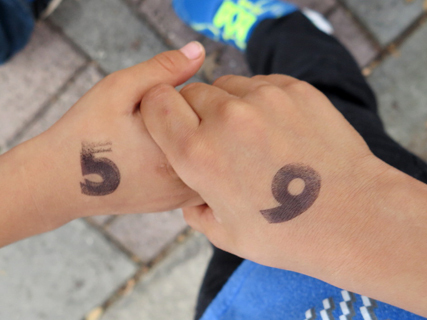 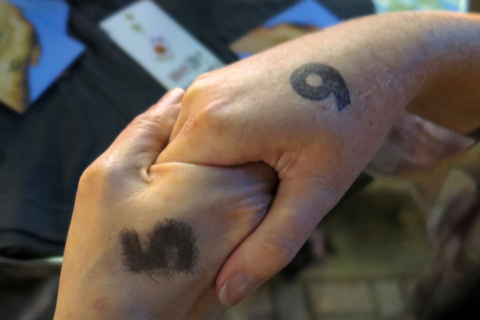 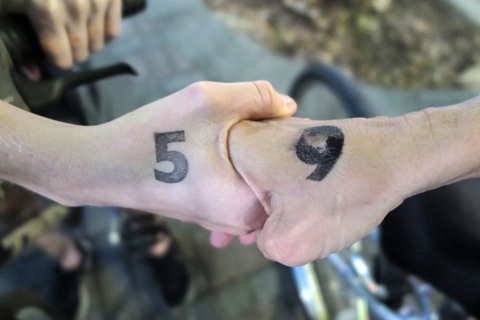 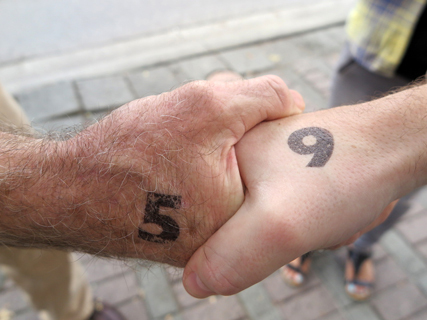 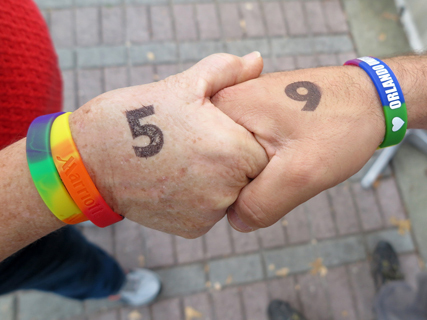 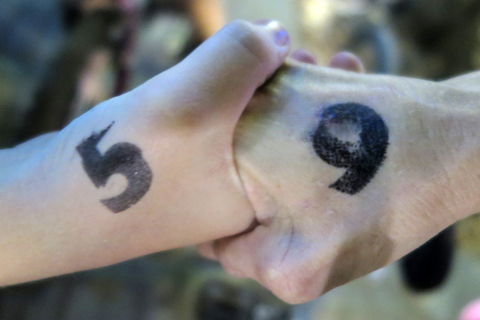 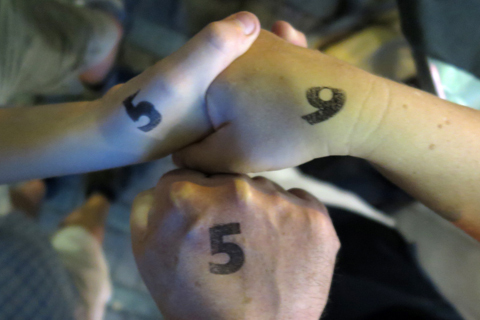 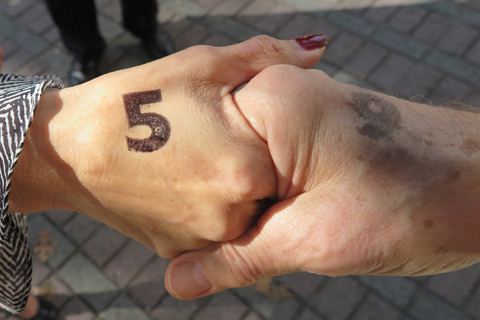 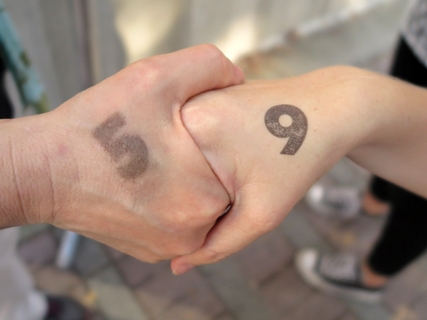 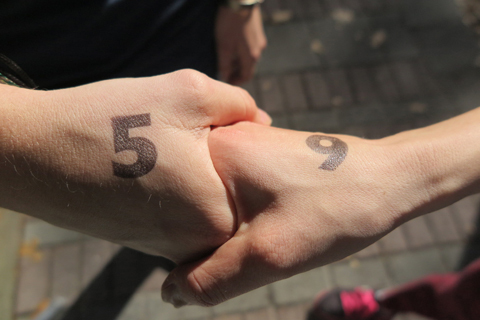 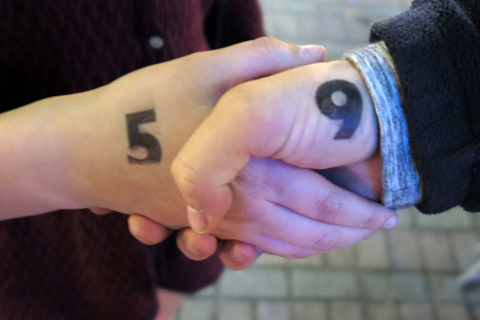 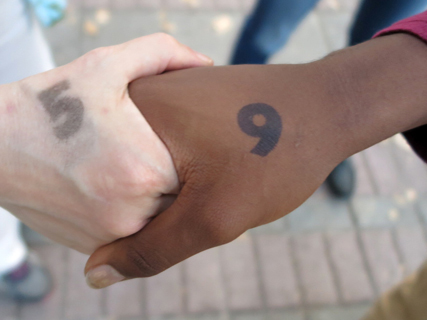 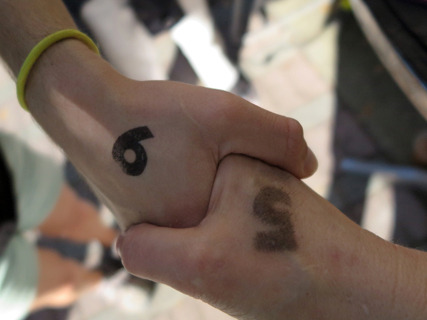 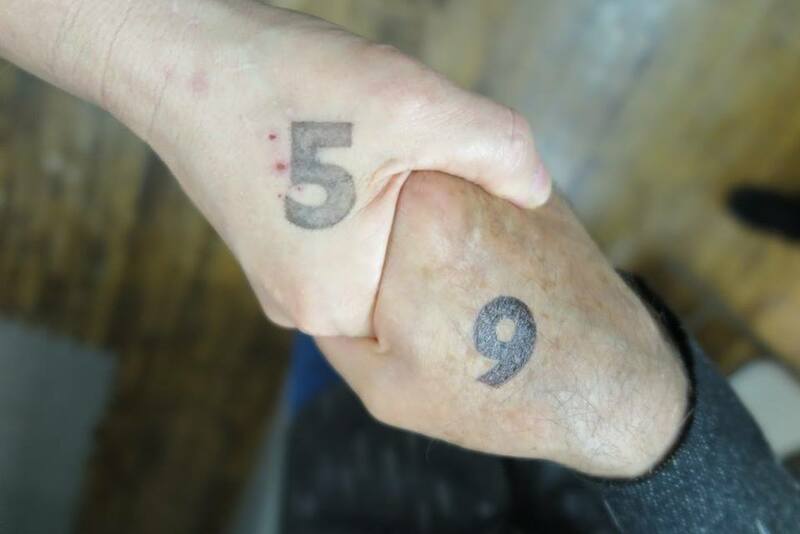 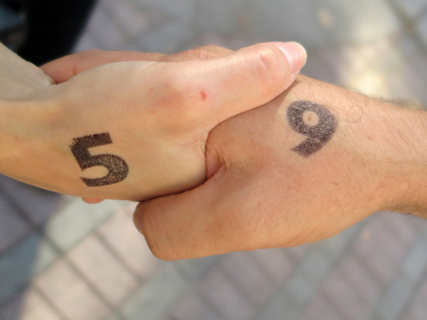 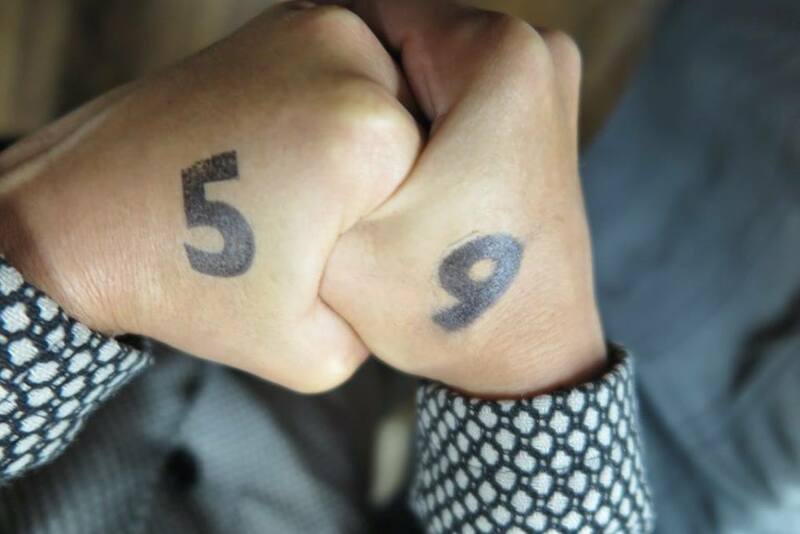 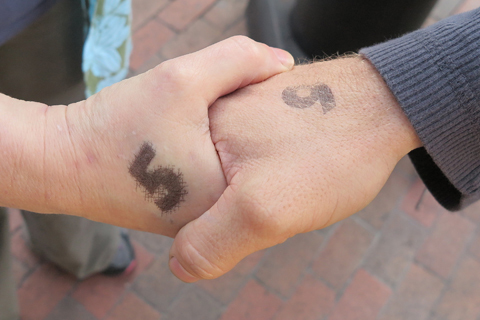 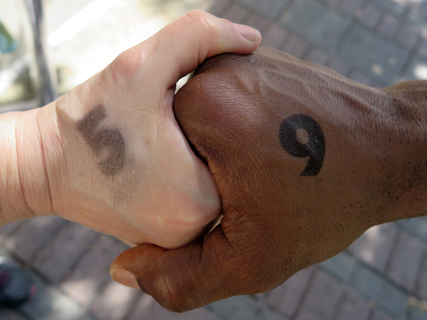 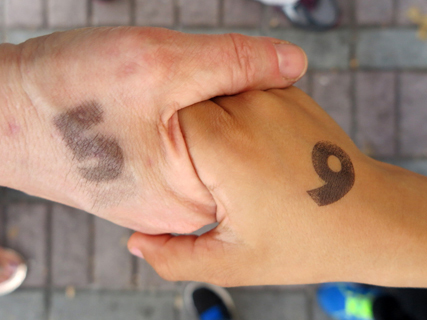 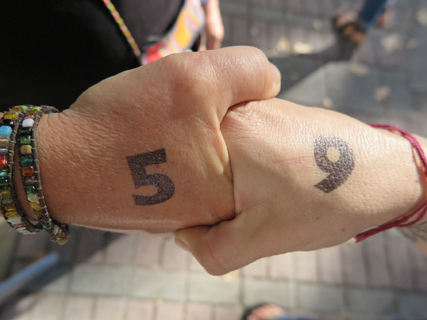 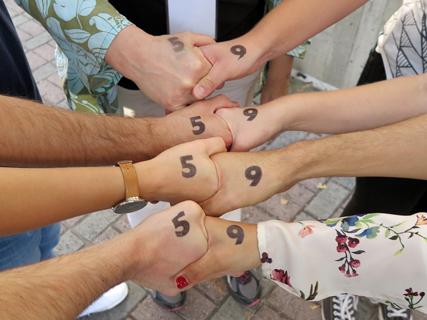 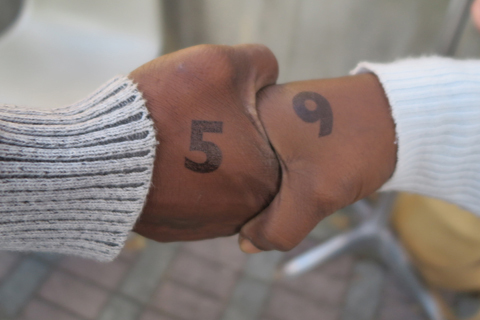 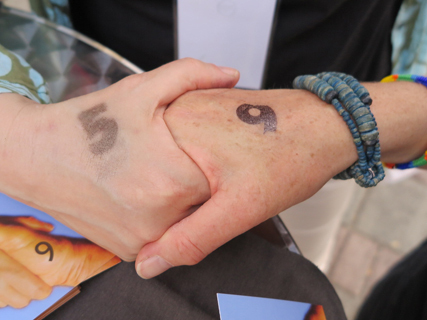 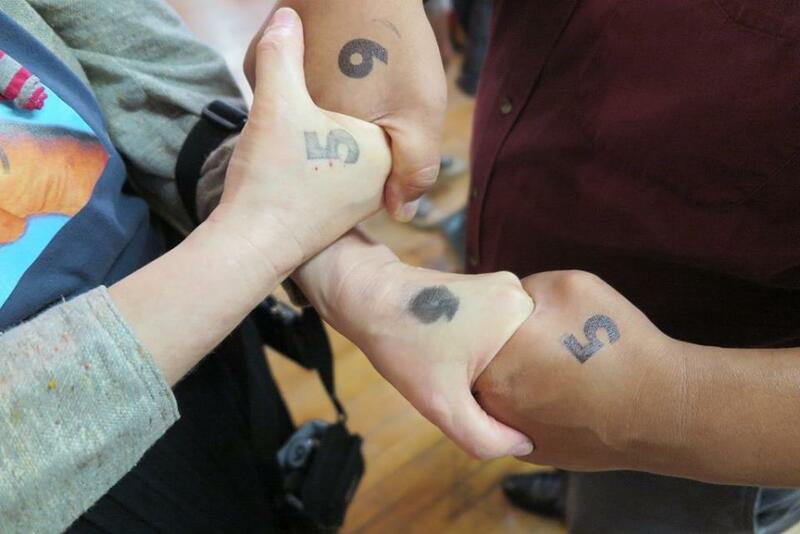 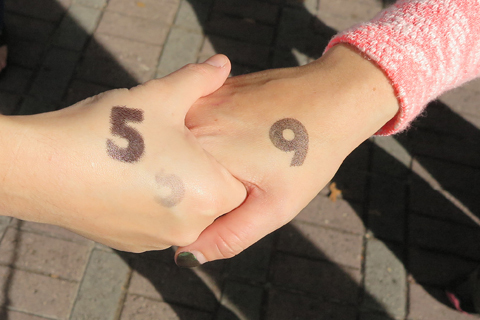 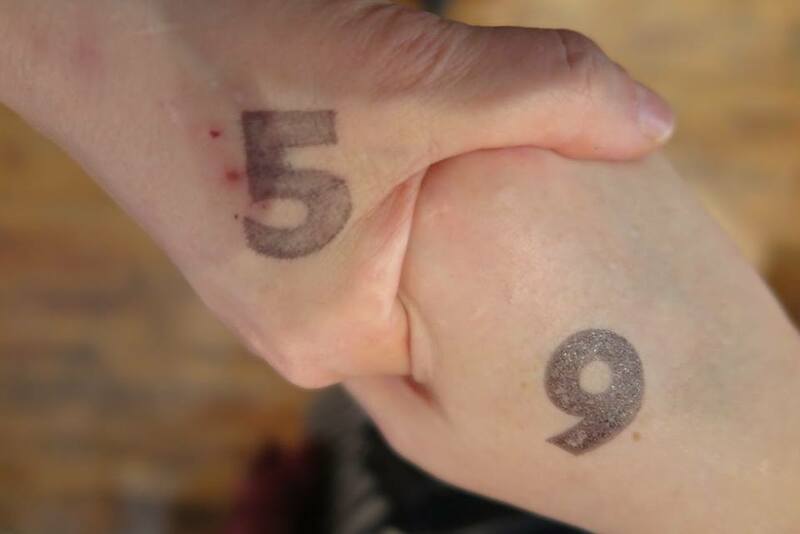 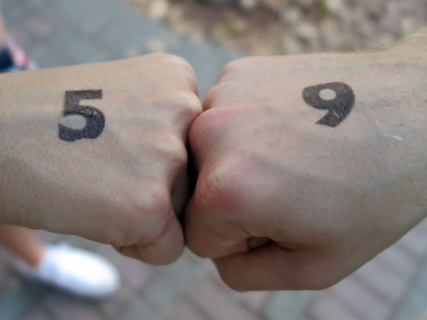 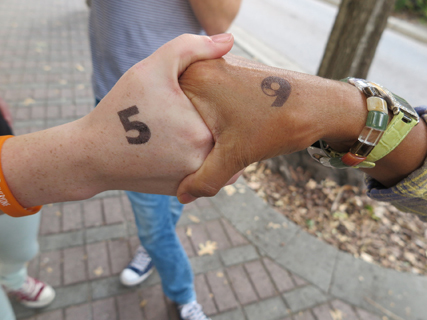 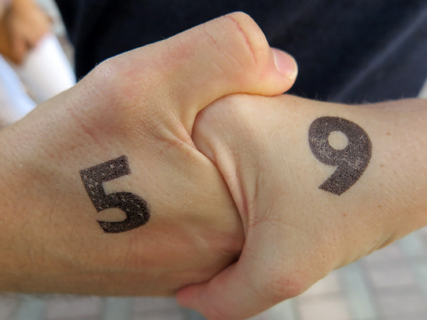 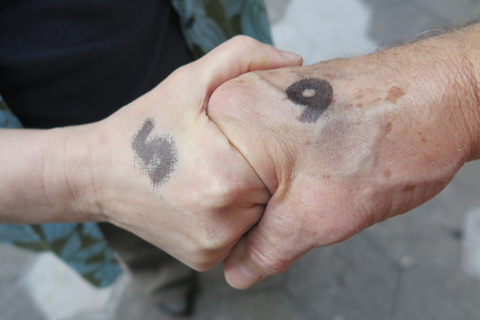 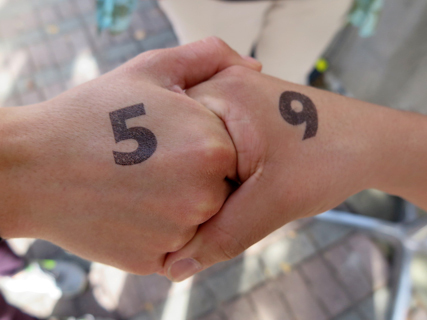 Random passersby had their hands stamped with either a 5 or 9 and were offered to find other hands with matching number to shake and form a 59. 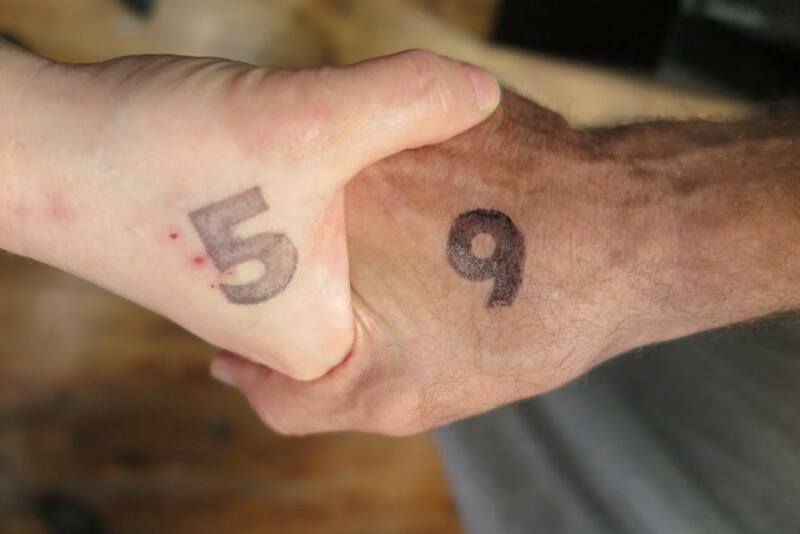 Performance Mix and Match 5&9 prompted random coincidental interactions while performing the number 59 in the friendly gesture of a handshake. 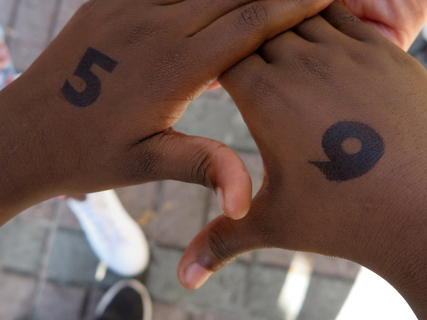 This Orlando weekend performance coincided with a massive Gay Pride Parade that was postponed from an earlier date due to stormy weather conditions. 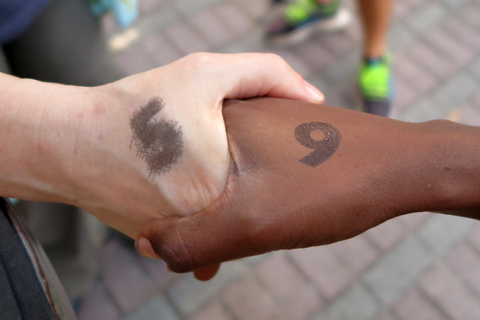 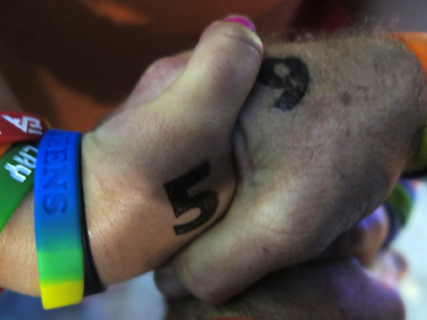 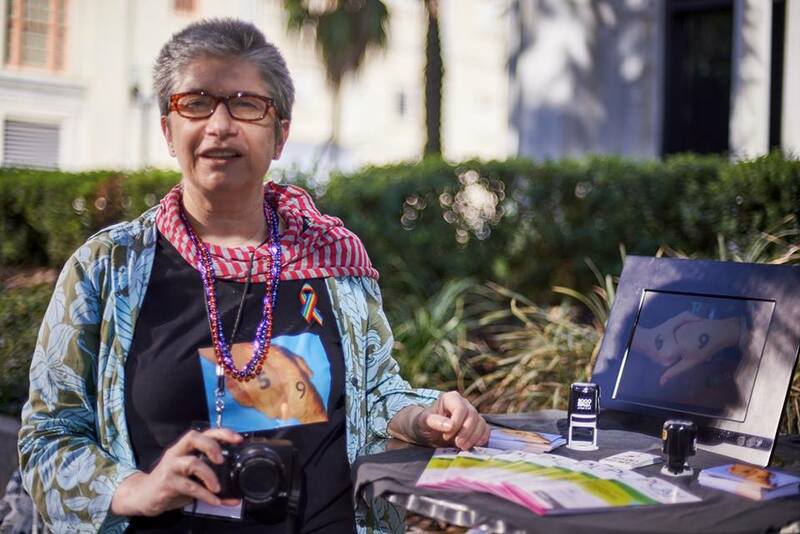 It was an extremely emotional weekend with feelings still raw for many of the marchers who either lost or knew those who had lost close friends and lovers. 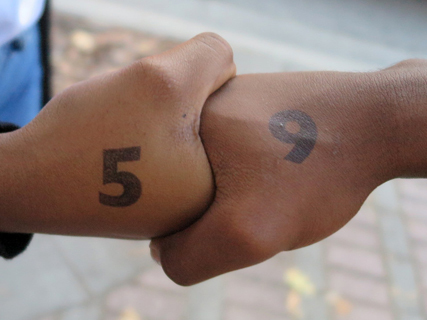 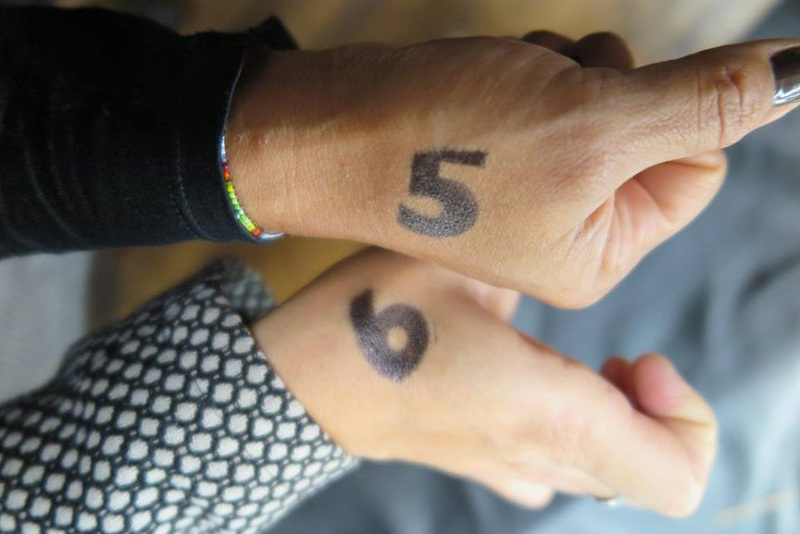 The numbers 5 and 9 represented online resources about the earliest documented person-to-person interactions. 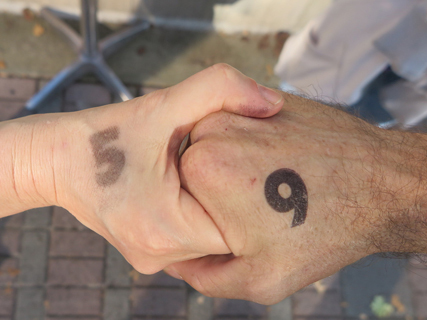 According to Wikipedia, the oldest image of a depiction of two soldiers shaking hands is found on an ancient Greece 5th-century BC stele, while History.com reports that the oldest documented handshake was in the 9th century BC stone relief, on a detail from Shalmaneser III's throne, depicting King Shalmaneser III of Assyria meeting a Babylonian. 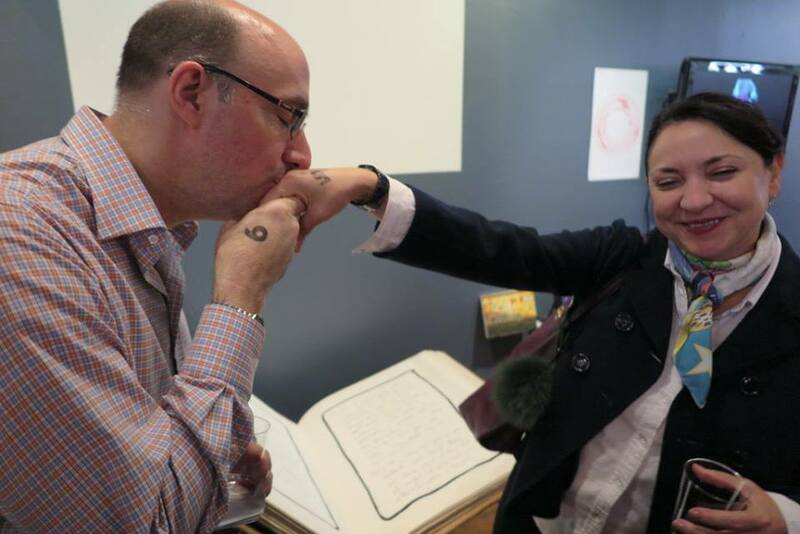 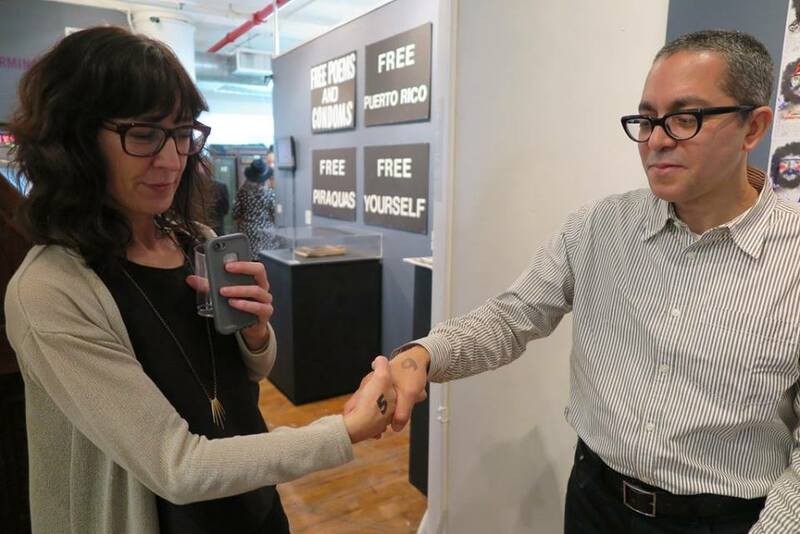 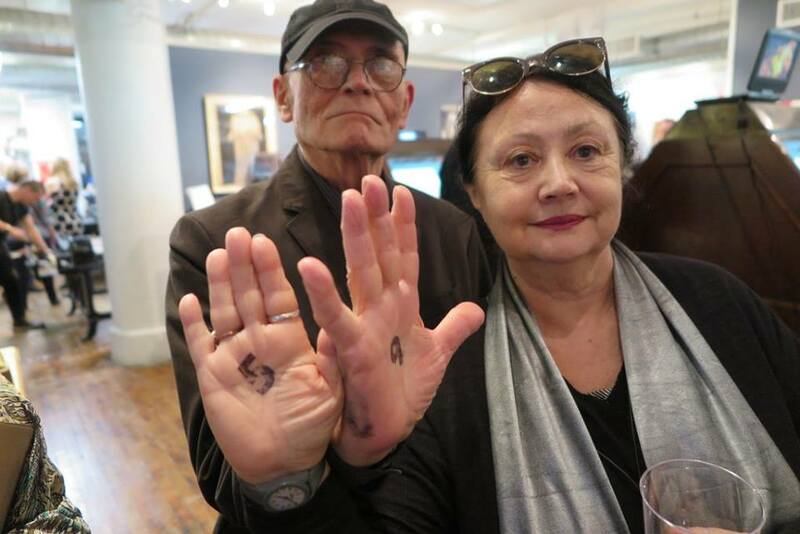 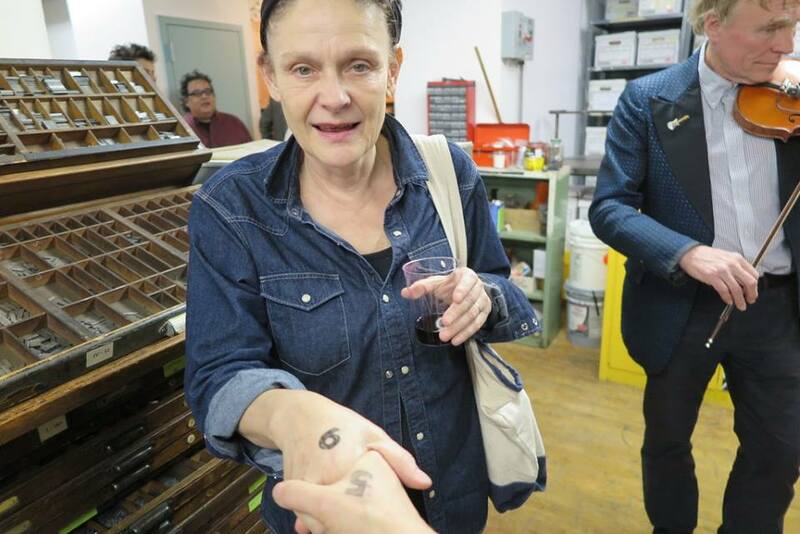 Additionally, Mix and Match 5&9 was performed on October 7, 2016 as an Artist Action at the opening of the exhibition Enacting the Text: Performing with Words, curated by Nicolás Dumit Estévez Raful at The Center For Book Arts in New York.